There is no strict standardization exist when it comes to laminate flooring measurements. Every manufacturer produces laminate wood planks or laminate tile and stone in dimensions based on product lines, plank styles or design of particular tiles. But, even though, exact width, length and thickness of laminate flooring very, there are few typical sizes of laminate flooring planks and tiles could be found at the local home improvement retailers or online flooring stores. 1 W – actual width of laminate flooring in inches (imperial units) with conversion to metric characteristics (centimeters). 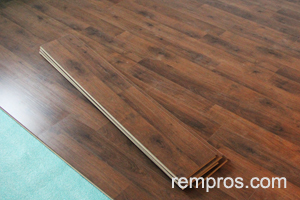 2 L – typical length of laminate flooring in inches and centimeters. 3 THK – thickness of laminate planks or tiles in inches and millimeters. 4 S – coverage area by single laminate wood plank or laminated tile in square feet and square meters. 5 N – number of laminate flooring planks or tiles necessary to purchase for an average size 10 x 12 (120 Sq. Ft.) bedroom. Parameter N includes 10% waste factor. Amount of laminate flooring to buy greatly depends on type of a product, room layout and installation method. Square footage of laminate planks and tiles which has to be purchased can be estimated with a high accuracy only after in home measurements. How heavy is laminate flooring plank or tile? Weight of laminate flooring planks significantly vary and mainly depend on plank size and thickness. For example, 3-strip 7 mm thick, 7-1/2 in. x 47-1/4 in. laminate flooring plank with no attached underlayment weight approximately 3.2 lbs. (1.5 kg) or 8-planks case weight about 26 lbs. (11.8 kg) plus weight of a box. Some laminate flooring sold with 2 mm. thick attached foam underlayment which helps to reduce noise and have excellent shock absorption properties. If laminate planks or tiles manufactured without underlayment it has to be purchased separately and installed over wood or concrete subfloor prior to laying flooring. Very inexpensive 25 Ft. x 4 Ft. polyethylene foam rolls which cover 100 Sq. Ft. each can be bought from the shelf of a local flooring retailor. Premium 0.125 in. thick underlayment with STC (sound transmission class) equal or higher than 65 and impact insulation class (IIC) equal or higher than 68 or 0.25 in. cork are great solutions for reducing noise transmission and provides moisture barrier in multileveled buildings. Each carton or box might consist anywhere between 6 and 12 laminate planks or tiles. There is no certain number can be defined because each manufacturer organizes flooring for shipment differently. With all variety of flooring products available on the market it is nearly impossible to cover all possible exact sizes of planks and tiles and nominal dimensions often used for defining width and length of laminate flooring. For example, 48 inches long, what is very common nominal length of laminate flooring plank, might have 47-3/4, 47-7/8 or 48-1/8 precise length.